If drugs are to enter the body painlessly and efficiently, they can be administered via skin patches. Researchers at Empa and the University of Fribourg are currently developing nano-containers for therapeutic agents that can be controlled by light. Not every medication is suitable for oral administration as a pill or can be injected with a syringe. The skin – our largest organ – on the other hand offers a large and permeable surface to absorb active substances. Nicotine, painkillers and contraceptives can already be administered through the skin using patches. Researchers at Empa in St. Gallen and the Adolphe Merkle Institute at the University of Fribourg are currently developing a system, with which the effect of drugs can be controlled by light switches. This allows precise control, for instance, of the dosage of active ingredients and opens up new possibilities for therapies with "transdermal" patches. To ensure that the ingredients in the patch can be precisely controlled, the researchers have devised a molecular light switch inspired by nature. "Our light switch works similarly to the retina in the human eye," says Luciano Boesel from Empa's Laboratory for Biomimetic Membranes and Textiles. Like the natural pigments in the eye, these synthetic photochromes can also be activated by light. The molecular switches were integrated into polymer nano-spheres, which were filled with test substances for initial experiments. When these nano-reactors are exposed to light of a certain wavelength, they change their structure. Thus, their surface becomes permeable and the chemically active substances can diffuse from the nano-reactor into the environment. If the color of the light changes, say from green to red, the chemical reaction stops within seconds. 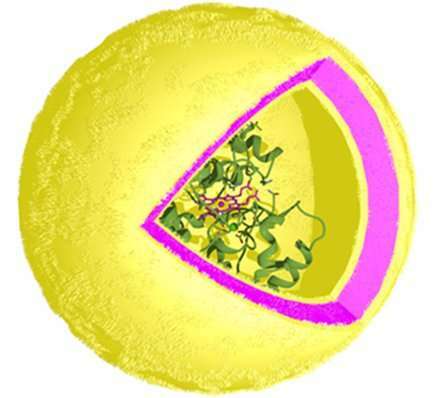 The shell of the nano-reactors turns impermeable and the reaction vessels are ready for the next use. In future, these nano-reactors with integrated light switch will serve as reservoirs for therapeutic agents. "Light switches can be used for the entire spectrum between 450 and 700 nanometers wavelength, i.e. for colored light from blue to red," explains Boesel. This opens up many possibilities for the controlled delivery of several drugs or for complex reaction cascades in a single patch. The team is now working with the support of the Swiss National Science Foundation (SNSF) and the National Center of Competence in Research for Bio-Inspired Materials to further optimize the nano-reactor with light switch. "First, we will investigate the precisely controllable release of substances that are already approved for application through the skin, such as certain painkillers," says the researcher. In the future, however, many additional treatments using "band-aids with light switches" are feasible.